Most Recommended App: Slack. It's great for collaborative communication. Last Thing You Read: I don't get a chance to read books very often, but I was recently able to do so and read Eleanor Oliphant Is Completely Fine by Gail Honeyman. It was fantastic and refreshing to get through a whole book! Tell us about your journey: I started my career in the apparel industry, both on the retail and wholesale side. After 10+ years, I wanted a change. Stephanie Reeves, who founded Edgar-Reeves, reached out to me to see if there was any chance I would like to dive into lighting industry. I had never thought of it before, but I agreed to join the team, and have never looked back. I worked several years under Stephanie and when she decided to retire, the opportunity to purchase the business arose. My husband and I carefully discussed the opportunity and investment. I presented my ideas and insights for the future, which would change the path of the business. We both agreed and went for it. It has been an incredible journey and I am so thankful to Stephanie for recruiting me to this industry and also for the team here at Edgar-Reeves. What's your favorite part of your day? 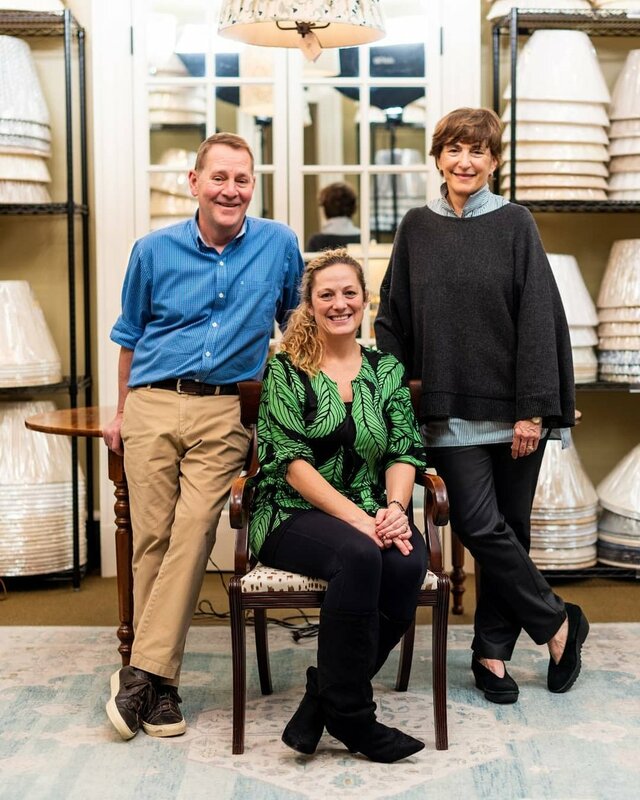 I love when you can see the excitement in the client's face for finding the perfect lampshade for their lamp or finding the right bell jar or lamp for their space. Also, I love receiving custom shades. It is fun to see all the different styles, fabric, and how personalized each one is. Outside of the work day, my favorite part of the day is when I walk through my door at home and see my 4 year old twins' faces and hear their voices. Makes my day! When do you feel most successful? When you see your ideas evolve and come to life. And even better, when clients are excited and prove that your ideas have become real and successful by increase in sells and new clients. What do you do to recharge when you’re feeling drained? I usually try to take a break from the project I am working on and start a new one. Allowing your mind to rest on one thing, yet accomplish another, can help. What do you know today that you wish you would have known when you first got started as an entrepreneur? Don't be afraid to ask to for introductions and make as many connections as possible. I find that most people want to see you succeed and the more you can spread the word about your business, along with existing clients referring you to others, the more you can grow. How do you optimize your day? I am a planner and like organization. I do the things that HAVE to get done that day, then the things I want to get done in the same day, and finally, I keep a list of everything else that needs to get done in the near future, so I don't lose track. But, I do have to remind myself that you can't get everything done in one day. Who is the person/people who allowed you to imagine more? Both my kids and my husband. Kids are so creative and see life through different lens. My girls asked me to bring two lampshades home for them to paint. When I gave it to them, they pulled out all their paint and used all different colors and marks to create their personalized shade. My husband is in finance so he is a huge asset on the business side. Also, as a co-owner, it is great to have him as a sound board. I can give him ideas and he helps me build on them or suggest a different path. At the same time, he sees no limitations and always encourages me to go for my goals and beyond. What does imagining more mean to you and your story? Design has endless options. For example, a lampshade can be made in so many shapes, sizes, fabrics, styles, colors, etc. It is amazing to see each person's vision and help them create it. Don't stop imagining! Use what's around you to think of new ideas, new products, new services, or whatever it may be. If you have passion, which I do for our business, I believe your imagination continues to grow and grow. If you could do more of one thing every day what would it be? Take a few minutes to myself and try to relax.